How does EdbMails Backup work? Can I test all the features of EdbMails Office 365 Backup before I Purchase? What is prerequisite and system requirement for performing the office 365 Backup? Do EdbMails provide storage space for office 365 backup copies? How much disk space will I need for my Office 365 backup? Few items have been missing after the migration / backup. Why? How is EdbMails Office 365 Backup is priced and licensed? Do EdbMails Backup Public folder and Shared folders? 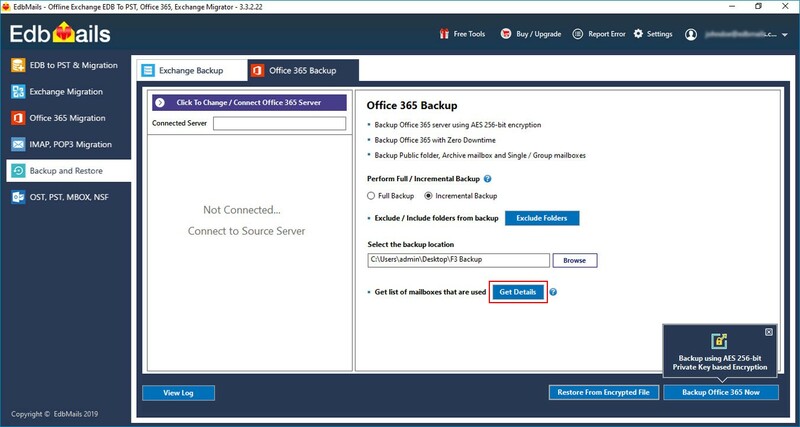 During backup operation will it affect on the performance for the Office 365 users? EdbMails application for Office 365 backup can be installed on any windows 7 and higher version or Window server 2008 and higher machine. Application connects to your Office 365 server via Exchange Web Services and backup mailbox data and Public folders to your local storage. To backup the user mailboxes from office 365 you need to provide impersonation rights to one of the user with admin rights and MFA enabled. Login with that user in EdbMails application and perform the backup. You can perform onetime backup or continuous backup with EdbMails. Continuous backups are performed in cycles. The first backup created is a backup of entire data. Subsequent backup create only the incremental backup. It updates only the new mail items or deleted items from the Office 365. 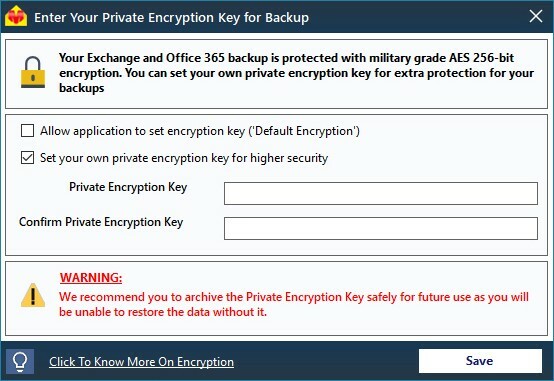 1.Click the ‘Restore From Encrypted file’ button from the Office 365 / Exchange Backup screen as shown below. Yes, you can test Office 365 mailbox backup. To backup the user mailboxes from exchange server you need to provide impersonation rights to one of the user with admin rights and MFA enabled. No. Main purpose of the EdbMails office 365 back is to create local backup.. This backup helps in legal requirement concerning data archiving, backup and recovery. It is always safe to protect your data by keeping your backup in your organization than on any 3rd party cloud service. It all depends on the size of data you want to backup. 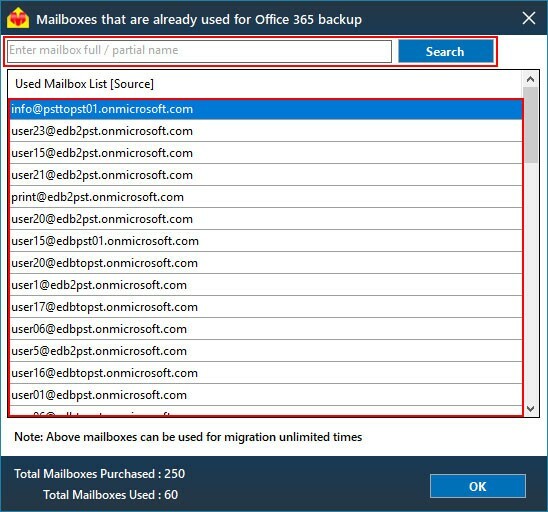 EdbMails office 365 Mailbox Backup will perform backups until there is free space left. During migration / backup there will be an error related to 'Mime Content Conversion'. That is, the item we attempted to migrate is corrupt and was rejected by the Exchange / Office 365 server during migration / backup operation. This error message indicates that the item is skipped during migration / backup. In most cases, you will find that the item is either corrupt or damaged. You may forward the affected items to the destination manually if it is necessary or using Outlook you may export / import the item. Please note that EdbMails tries to repair and normalize invalid MIME content, but this may not always succeed. How is EdbMails Office 365 Backup is priced and licensed ? 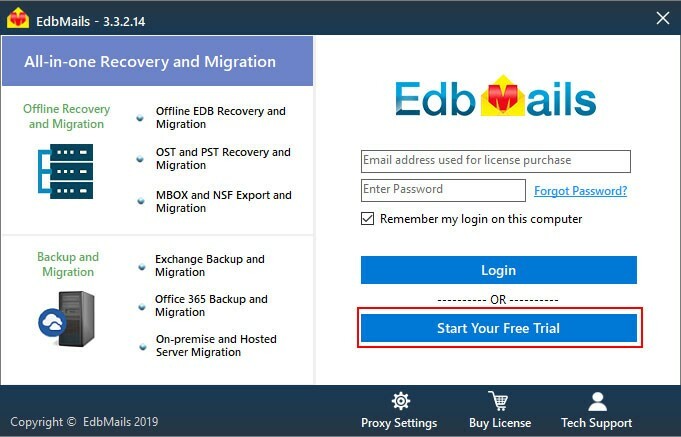 EdbMails Office 365 backup license is priced annual subscription according to the number of mailboxes chosen for backup. There is no monthly subscription available. On the expiry of your subscription you will be no longer be able to backup the data, but you will still be able to restore items. 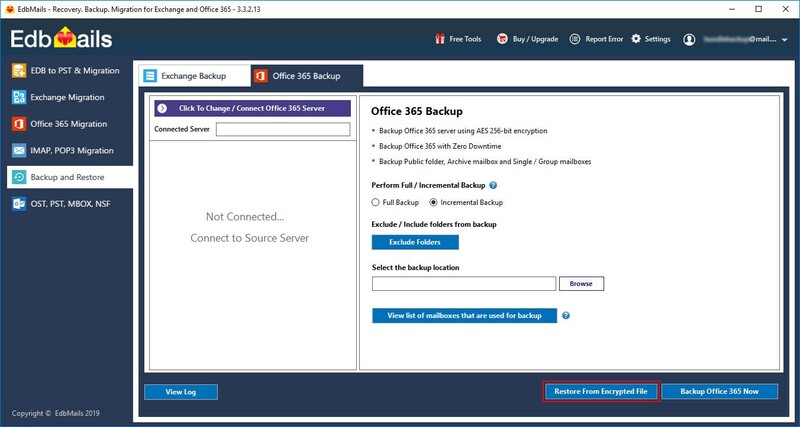 No limits, the performance of office 365 backup depends on environmental factors such as: speed of the hardware, speed of the mailbox access, Office 365 server performance, EdbMails office 365 Backup for Mailboxes uses EWS to connect to the server. The EdbMails backup operation doesn’t impose any restrictions on the usage of mailboxes by the users. Users can continue to work as they normally would while EdbMails continues with the backup tasks assigned to it in the background. This means no disruption to the workflow and zero downtime.